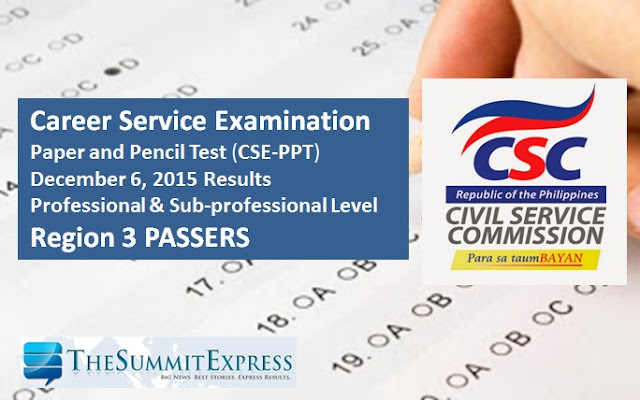 The official results of December 2015 Career Service Exam- Paper and Pencil Test (CSE-PPT) are finally released online on Thursday, January 14, 2016. The Civil Service Commission(CSC) released the full list of passers per region for the Professional and the sub-professional level exam. Examinees of the December 6, 2015 career service exam in the Region 3 (Central Luzon) may now check results on this webpage. More than 56,000 examinees took the Civil Service Examinations in areas where the examinations were suspended and re-scheduled due to onslaught of Super Typhoon Lando last October. All concerns on examination result, including verification of Examinee Number, should be coordinated directly with the CSCRO concerned. The certification of Eligibility for passers (printed on CSC letterhead, free of charge) shall be available soon.